It’s my new hobby, I think, watching different adaptations of the same source material. Oh yes, I do like to live dangerously, of this there can be no doubt. I’ve done it previously with The Killing (you can read about that here) and I’ve also tried it with ‘Let The Right One In' (try clicking here and here for that stuff). This time, it’s The Girl with the Dragon Tattoo. I read the book back when it first came out, just before it became something of a publishing phenomenon. I wrote about that reading way back here. Jees this is getting like some kind of a half-arsed infomercial. I’m all-done with the links now. I promise. With regard to the books, I really liked the first one, I was a bit ‘iffy’ about the second one and I simply hated the third one. It was the ‘Law of Diminishing Returns’ in all its glory. That first book, though, I really did like that. For all the talk and debate about it, I felt that it was really just a classic ‘locked room’ murder mystery with various bells and whistles hung on to it. I like that kind of thing so it was ideally suited for me. And then, yeah, as most-everybody knows, there was two films made of the first novel of the trilogy. Firstly there was the 2009 Swedish version and then, with much hype and expectation, the 2011 David Fincher version. There has been much discussion about which of these versions is the better one. When I announced on Twitter that I was treating myself to the Fincher one first on Bluray, it evoked a small storm of equally meted-out support and derision. This level of debate interested me so I resolved to see both films and try to dispassionately decide for myself which one I liked better. If I was any good, I would now string you along for another five hundred words before I pronounce on which one of these two versions I liked the best. But, sod it, it’s my blog and I don’t feel the need to be any good today. I liked the Fincher one better. Cheers, boos, hisses, celebratory high-fives – I hear them all (but only in my head, of course. I’m not a fool, I know that nobody cares). So, now that I’ve answered the question, allow me to talk around it a bit. It’s kind-of what I do. The main reason I like Fincher’s one is very easily summed up. It’s more Cinematic. It looks great, it has great big starry actors in it, it’s highly produced, very well written and it has a title sequence to die-trapped-on-an-island for. It’s like James Bond with loads of black motor oil, you really should see it. I really like those BBC4 Nordic Murder Dramas, The Killing, The Bridge, Wallender, and, surprise surprise, I found that I really liked this version of ‘Dragon Tattoo’ too. One of the great things that it has going for it is the fact the cast are largely unknown to us. I wasn’t looking at it saying ‘There’s James Bond’ or ‘Oh look, it’s that 'Sound of Music guy'’. The characters were all there, without any baggage. It helped. Now, I say that and I know that the leading guy, Michael Nyqvist, went on to be the main baddie on 'Mission Impossible 4 – Ghost Protoco'l and, of course, Noomi Rapace went on to ‘Prometheus’. I know, I know but, still, in this film they don’t reek of star quality. I liked that. My recommendation is that you see both of these adaptations but that’s probably silly, you can’t all be as nerdy about these things as me. If you have to go for one of them, I think it depends on what you like. If you love your BBC4 Nordic Drama, I think you could do very well with the Nordic version of this, with the added advantage that you have two more movies to look forward to. If you like what Fincher does, which is big and dark and very cool, then I would treat yourself to the big Hollywood show. Me, I’m glad I saw both, I enjoyed them. 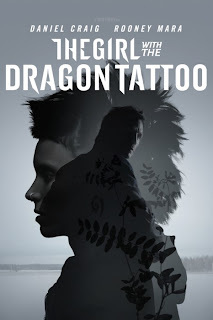 I can’t write about 'Dragon Tattoo' again without paying at least nodding reference to a plot hole as large as China that I see in the whole thing. It doesn’t spoil my enjoyment of this bleak, isolated, violent, misogynistic tale but it’s still an elephant in the room that I can’t ignore. - ack, I can’t do it. Maybe I’ll go into the spoiler in the comments section, if anyone’s bothered. That might be for the best. For what it’s worth I think the original Swedish version highlights the ‘flaw in reasoning’ quite a bit more than the Fincher version does. I think this is down to the original film retaining a ‘trip to Australia’ sequence from the book while Fincher just ventures to London instead. I think it teaches me that, if you’re going to go off in search of a plot hole, it’s probably best not to travel too far. Interesting read. The original Swedish trilogy were a made for TV effort with 6 90 minute episodes which I believe were subsequently edited down into the 3 films. So your "It looks and feels more like one of those Saturday night BBC4 Nordic murder dramas…" comment is pretty accurate :-). I've bought the original unedited trilogy and while I can agree that they lack something of that 'cinematic' feel I still think they are very good and deserve to be watched. The voice dubbing is a notch above the normal crappy dubbing that you experience with foreign productions too (altho' I prefer watching with the subtitles on). In response to Pete's comment, I think it was the second and third films that were originally made as a TV series. The first film was made as a feature film, for a modest budget. I think it's a great looking film, although hardly surprising that it's not as cinematic as Fincher's version - which I am yet to see - as he's Mr Cinematic. I've never been unable to sign on as a fan of this phenomenon because of more than one plot hole. As you say. Plot holes undermine motive and opportunity. I come away feeling as if the whole thing is overrated. I'm all ears for the plot hole discussion now, Ken. I've only seen the 2009 version of this. There was probably a sub-conscious battle in my brain at the denouement as the part of me having a good time frantically damped down any attempt by logical me to analyse any plot holes. Pete: Thanks. Interesting on the 6 x 90 minute episodes. I didn't know that. I agree with you, although I've only seen the first one, that it is well worth seeing and I'm going to watch out for the other two with interest, as they appear on TV. DB: It is a great looking film. I meant to write how I think that Fincher's movie owes quite a bit to it visually. The island house they set up base in, for instance. I think Fincher followed the movie as much as the book. Art: I can forgive things if the ride is good enough. I know I shouldn't. I think the other two books firmly confirm the overrated tag but I still like the first one. Perhaps it's not exactly a 'plot hole' but it annoys me nonetheless. It's about the girl who everybody was searching for. When she turned up, alive, in another country, we were treated to a scene of joyful reunion. But she *knew*, man, she *knew*. She knew about all the serial murders, she had investigated them after all but, still, all she ever did was send flowers every year. Why the hell didn't she write a letter blowing the whole business apart? She could have saved so many other girl's lives. I guess it could have been explained away in the plot but, as far as I can tell, it wasn't and that, as I said, annoyed me a bit. Oh, I can agree about being forgiving if the ride is really good. But for me the ride has to be REALLY good. Take Raymond Chandler, who is not noted for his plots, but his writing and characterizations are so amazing it all makes sense anyway. From my skimming of these novels, I wasn't that impressed with the writing, or anyway not enough to be forgiving. I know I may be the inertia voice here, and I admit I've gotten pickie after reading mystery and SF novels for forty years about such things. The plot hole you mentioned really bothered me even in the Fincher movie, too. It seemed bloody obvious, so . . I watched the original Swedish film a while back (which I thoroughly enjoyed) and had planned to see the remake but things kept getting in the way. Your blog was the excuse I needed and so I watched it last night. I agree, the remake it better although remaining faithful to the film if not the book—the couple of minutes in Australia being neither here nor there as far as I was concerned. The new title sequence was amazing and, like you, the first thing I thought of was Bond but very dark Bond. Because the remake was so faithful I’m afraid it did drag a bit for me because I found I could remember more than I expected I would but I did like the slightly downbeat ending to the remake and I also thought it was clearer what was going on there although I’m not going to rewatch the original to see if it’s just me faulty memory. As for the plot hole… I tend to suspend disbelief when I watch films these days. I enjoy the visuals that what’s going on in the moment but I don’t question too much what’s going on. TV is what I watch to relax. The exception to this are American cop shops like Castle and Rizzoli and Isles where half the fun is waiting for the one piece of evidence—a dod of mud that can only be found in one square foot on the city—that will break the case wide open. That said I would recommend Awake for a nice twist on the usual cop show: a cop is in a car accident where in one reality he loses his wife and in another he loses his son. Whenever he wakes he moves from one to the other and uses clues from one reality (where he may be investigating a completely different crime) to solve a crime in the other. Is one ‘reality’ a dream and if so which one? No idea if it’s sci-fi or what—who knows he may be submerged in a tank with electrodes on his head at the end of the series—but it is an intriguing premise. Ken, Gerry - The 'she knew all along, why the hell didn't she do something to stop it??' problem did pop into my mind at the the time of her discovery and her tearful reunion with her uncle, but I'd enjoyed the ride so much that I didn't overly analyse it - I think I made some attempt to rationalise it by assuming that she didn't know what Martin had been up to during her years abroad. Yes, she must have known about the killings before her disappearance, but she probably wouldn't have known about the subsequent murders. But it also raises the question of her complicity in the whole thing - she *could* have blown the whole thing apart, but chose not to. Another dysfunctional, selfish Vanger? Personally, I think it is a weakness in the story, one best not dwelt on for too long! Ken, just caught up with this weeks blog! I saw both, but I prefer the Swedish one, both were good in their own right, but the Swedish version left something. Days after viewing it would still come into mind, still make me think and on a number of occasions, make me glance sideways when up early in dark mornings. The same way the film Dog Soldiers did (and still does), that's why for me, it will be the better version, it still invokes a feeling. I've seen both films and like both, but the original Swedish version is my favourite for one reason. I think Noomi Rapace is a much better Salander than Rooney Mara. Rapace is totally convincing but I found Mara much less so. She plays a cold distant Salander with strangers, but as son as she connects with someone the coldness becomes warmth (particularly in her face and eye contact) and I just wasn't convinced by that. And Craig, well he's good but he's too familiar, too Hollywood by far. The Swedish cast just seem so much more authentic. But the Fincher film is neater and - that word you use - more cinematic for sure. Both are unmissable if you like the books! I watched the 2011 version last night. Whichever version you watch first probably has the greatest impact, don't you think? Not having read the book, I've no idea which is more faithful to the original source - I suppose both take some liberties with the plot. I found the 2009 version much more believable. Helen makes a good point about the different portrayals of Salander. In the 2009 movie the edginess of a social disconnection was always there even with Blomqvist. Having Anita deceased served the plot much better in my opinion. Was Martin so cooperative in the Swedish version? Probably - I was just acutely aware of it second time around.